On our Karma Yoga journey to Peru from September 13, 2008 - September 27, 2008 you are invited to experience Andean culture, Iyengar and Karma yoga, and the fulfillment of making a meaningful and positive difference. This 15 day program provides an inspiring new type of volunteer vacation that unites humanitarian work with the underlying mission of selfless service and Karma Yoga. The program offers adventure, cultural immersion, and the opportunity to transform the self, all in the captivating Sacred Valley of Peru. Our program brings us to the town of Urubamba, Peru, about an hour from Cuzco and situated in the heart of the Sacred Valley. This peaceful and intriguing town is surrounded by both historic ruins and snowcapped Andean peaks, while also serving as a central point and major market for the surrounding communities. 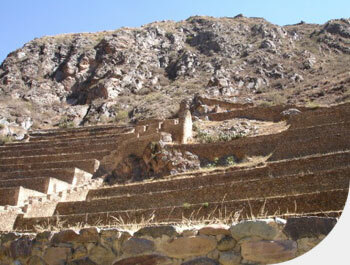 Peru itself stands out in the Americas for its geographic and cultural diversity. The Peruvian Andes are home to millions of highland Indians who preserve much of their traditional way of life and still speak their ancient tongue of Quechua. Frequently referred to as the "Land of the Incas," Peru is famous for its valleys once inhabited by pre-Incan civilizations and numerous cultural and architectural wonders. During our stay and between days of volunteering we will be going on several Sacred Valley cultural and adventure excursions, including trips to Ollantaytambo, Pisac, Sacsayhuaman, Chicon, Salineras, and concluding with the grand wonders of Machu Picchu as a two day option at the end of the journey. While Peru's beauty is quite captivating, unfortunately, over half of Peru's 25 million people live in poverty, making it one of the poorest countries in South America. Peru faces many troubling social and economic challenges making it difficult for its citizens to have basic health care, education, and social services. During our program we will be able to extend our Karma Yoga practices by volunteering at a local orphanage and taking part in art and play therapy with the children. We may also have the chance to plant local flora as part of an ecological conservation program. This volunteer vacation provides us with the opportunity to practice our commitment to yoga in myriad ways and places, both on and off the mat. You'll work from your heart through your hands among friendly people in a beautiful country - this is a journey that transforms and unites your self and the world.